Issued May 18, 2010, to Bandai Co. Ltd. The ‘781 describes a computer game similar to other “falling block games” like Tetris or Columns, in which the player operates a falling object that falls in a predetermined area. 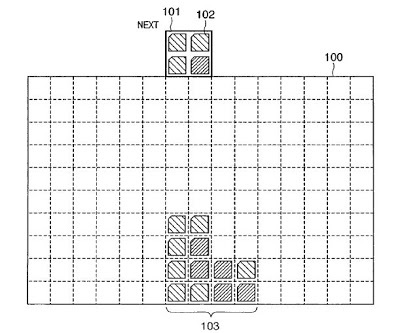 The ‘781 patent differs from previous falling block games in that, unlike previous games, the blocks do not disappear immediately after a predetermined condition is met. Here, the objects are cleared after a sequence bar has passed. The sequence bar moves vertically or horizontally in sync with a music output to make the game more enjoyable for the player. The game described under the ‘781 patent also allows for unusual patterns to meet the clearing requirement. For example, if the blocks for the shape of a dog, that will be an acceptable pattern which will be cleared whenever the sequence bar moves past it. By adding these new patterns for clearing, the makers hope to keep the player entertained in new and exciting ways. A computer game which makes the player operate a falling object that falls in a predetermined display area, and clears the falling object and falling stop objects by combining the falling object and falling stop objects under a predetermined condition. If falling stop objects including blocks that stop falling include a group of blocks which meet a predetermined clear condition, the group of blocks are registered as blocks to be cleared, and the control waits for a clear waiting state. Even in this waiting state, the next falling object begins to fall. After that, when a sequence bar (701) which moves vertically or horizontally in synchronism with a music output along with the progress of the game has passed the blocks to be cleared, these blocks are cleared. 1. A computer system comprising: a processor; an operation unit that makes an operation input to a game, by which a player controls a falling object that falls within a predetermined display area, and clears the falling object and falling stop objects by combining the falling object and the falling stop objects under a predetermined condition, a display unit which displays information associated with the game, a computer-readable storage unit which stores data required to execute the game and program instructions, and an audio output unit which outputs music along with progress of the game based on the stored data, wherein execution of the program instructions by the processor controls the computer system to: display the falling object at a falling start position by setting display position data of the falling object at the falling start position in the predetermined display area of the display unit; change the display position data of the falling object to move the falling object displayed on the display unit in a lower direction of the display area independently of an operation input from the operation unit; change the display position data of the falling object to move the falling object in the lower or horizontal direction of the display area in accordance with an operation input from the operation unit to the falling object; stop, when the falling object reaches a falling stop position of the display area and satisfies a falling stop condition, falling of the falling object, and displaying the falling object as a falling stop object; determine if the display position data of the falling stop object and display position data of other falling stop objects which are arranged around the falling stop object in advance satisfy clear conditions; generate, when the clear conditions are satisfied, clear object data used to register a portion of the falling stop object which satisfies the clear conditions as an object to be cleared, and storing the generated data in the storage unit; highlight the registered portion of the falling stop which satisfies the clear conditions; display a sequence bar which moves in the display area in a direction which is different from the lower direction in synchronism with the music data which is read out from the storage unit and is output from the audio output unit along with progress of the game; determine, on the basis of display position data of the sequence bar, if the sequence bar has moved past the portion of the falling stop object corresponding to the clear object data stored in the storage unit; and clear, when it is determined that the sequence bar has moved past the highlighted portion of the falling stop object corresponding to the stored clear object data, the display of the highlighted portion corresponding to said stored clear object data while maintaining the display of other portions of the falling stop object that have not been determined to satisfy the clear conditions.